Last night’s BBC news programme The World Tonight had a revealing report showing exactly what kind of leadership Western colonial states would like to see replace Bashar al Assad in Syria. 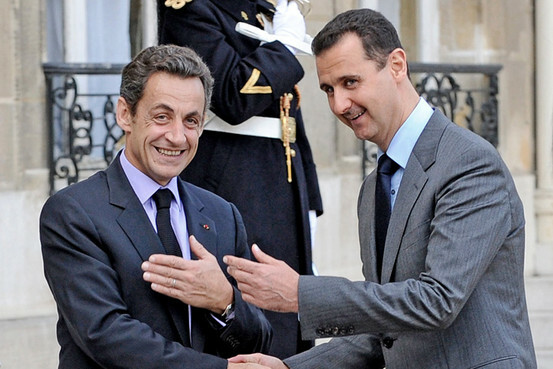 Britain, France and the United States all strongly supported the regime of Bashar al Assad, as they did his father, who both secured their interests at the expense of their own people. They only withdrew their backing for him after months of slaughter in 2011, realising their man in Damascus had no long-term future. All the talk has been of a ‘Yemen-type solution’, where the core regime remained secure at the expense of the man at the top and his family. The BBC report was about Brigadier-General Manaf Tlass, who ‘defected’ from the Syrian regime in July 2012 and gave an interview to BBC Arabic yesterday, touting him as a possible future leader. The report acknowledged that Tlass is ‘unlikely’ to be the unifying candidate – but argued if anyone could do it, it needed to be a man like Tlass, with his ideals. So, what exactly are these ideals, and who is this man that has the qualities Washington, London and Paris are desperately looking for to replace their man in Damascus. Tlass is a man who has spent his life in the centre of Syria’s inner circle. He was a close friend and confident of Bashar al Assad, as well as his brother Basil who was once touted as the heir to their father. Tlass’s father, Mustafa, was a close ally of Hafiz al Assad, and served as his ‘defence minister’ for decades – so being party to suppressing all dissent. Indeed, the BBC radio report was forced to acknowledge Manaf Tlass himself ‘had blood on his hands’, so was far from an untainted candidate to unify the fractured external opposition. Tlass claimed that he was ‘against foreign intervention’ in the region’, being all too aware that overt military intervention by the West would be opposed at a grass roots level in Syria who saw the outcome in nearby Iraq. Yet this claim is qualified by the fact that his defection was organised by the French intelligence services, a clear manipulation of events behind the scenes and using regional players to execute Western interests. A prime example of this was how Tlass was welcomed in Turkey by Ahmet Davutoglu (Turkey’s Foreign Minister) – in a way no other defecting military officer had been before or since. Tlass warned in his BBC interview that if the international community lost interest in Syria ‘all possibilities (for future outcomes) were on the table’. Commentating on the interview and Tlass’s qualities, Professor Joshua Landis (Director at the Centre for Middle East Studies at the University of Oklahoma) said whilst the odds were against his being accepted as the answer to where to find an alternative to Assad, ‘if anyone could do it’, it was ‘someone like him’: well-known in Syria, able to win people in the current regime and against Islamic politic groups. Here Landis summarised the Western position in Syria: They will trade the Assad family in order to exclude any role for Islam in a future Syria – but are desperate to find a candidate who will work with the anyone else from the current regime (hated by the people), yet work with the non-Islamic opposition groups. These secular opposition groups are the ‘divided opposition’ mentioned in media reports, who represent a minority opinion within Syria, in contrast to the majority of people on the street and within the Free Syrian Army, whose call is more Islamic in its flavour. Whilst most people see Tlass as an unrealistic leader, with too much past baggage, the manner of his defection and the discussion surrounding it reveals much about current events in Syria: Western interference is alive and kicking; regional players like Turkey, Qatar and Saudi Arabia will be the face of any initiatives but are pursuing the agenda of the international community; there is no desire to support the masses for the freedom from colonial interference, and a strong effort to suppress their Islamic aspirations. But most of all, it reveals a hidden hope that most people will not see – and that is (as Tlass put it) that ALL possibilities are on the table; which includes the prospect of Islamic change, and so real liberation for the people of Syria. This is a biased issue and should clearly be filed under opinion and commentary. A few points: the author, as stated, Dr. Abdul Wahid is the chairman of hizb al tahrir. A hardline and controvercial movement that wants to promote a pan Arabic Islamic caliphate emirate. He is an extremist who has learned to sugar-coat statements to make them more digest able by the mainstream. I live in Syria and I can assure you most want the next government to be secular and that, contrary to his allegations, the average Syria and FSA member is not interested in an Islamic state. Now as far as Manaf Tlass is concerned, stop making broad and vague statements such as he has blood on his hand. Unless you have specific information that will prove that, it is all allegation with the purpose of defaming his character. For the sake of journalism, check our facts before writing. Thank you. The Tlass family is the one of the most prominent historical backers of the Assad regime – Mustafa Tlass (Manaf’s father) was defense secretary throughout the last two decades, and was responsible for dealing with crushing internal dissent as well. Manaf was a senior member of Assad’s inner circle since 2005 and openly backed the regime for months during the start of the uprisings before changing sides. To claim his hands are free of blood undermines any comment you may have had to make. Could you please name some of the interests which were secured by Hafez Al-Assad and Bashar Al-Assad for these countries. The main issue interest of all Western countries in Syria and the surrounding regions that comprised the historic region known as Bilad al Sham is its strategic location. A recent example is that the Baker Hamilton report outlined the role Syria played with regards to stemming the insurgency in Iraq. Its location near occupied Palestine makes it an essential player in securing Israel’s occupation according to Western interests. 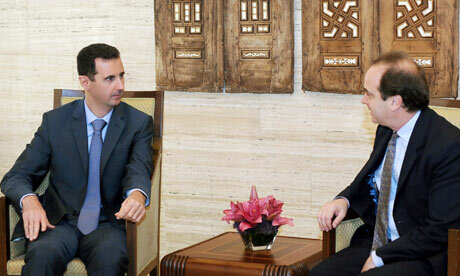 Whatever the rhetoric about ‘axis of evil’, Syria has work alongside US interests – whether in Iraq or Lebanon. The neocons didn’t trust Syria but even then things did change when they needed Syria as the insurgency got harder to manage.